Was a great win yesterday from an awful team, two Liverpool fans at my work said I must be embarrassed by the result and performance yesterday, I just smiled at them shook my head and said yes doesn’t it feel great !! Says it all really. A father worries about his son and most of all wants to share those magical weekend moments they can relive forever. This is their third year of season tickets. James’ memories are Moyes and Van Gaal football, and the rebuilding job. Poor lad. His Grandma says he’s a built in noisemaker in the house. Can you imagine how loud he would get if United woke up and wowed Old Trafford? I was hoping they would lose the next three matches to provoke a real crisis, rather than limp along like this. Then Van Gaal and maybe even Woodward would go, and maybe, just maybe the Glazers would sell. Serious even heretical stuff. But let’s face it there’s no chance of the Glazers selling or even Woodward getting the sack while Adidas, Chevrolet, DHL, Aeroflot, Aon, and the legions of fast food, beer, wine, noodles, paint, diesel engines and medical equipment sponsors hand over the billions to the brand. In the meantime maybe we should get T shirts made? Brand On The Run. Steve, James and the rest of us will just have to wait while hopefully that sponsorship money is translated to success on the field. As argued here loud and often, the problem with that is great players want to win the Champions League; the soon to be great players are hard to identify (see Memphis DePay); and the could be great players are coveted by their clubs – see Harry Kane. With Adidas’s help United could land a biggie this summer, but is a biggie like Bale or Reus or Muller enough? And what about John Stones? Can United get him if Barcelona are interested? Then there’s the Mt.Everest of “what ifs”. What happens if they are 5th and don’t win the Europa Cup? No biggie for Ed, Louis, the sponsors and most of all us – that’s what. Sunday’s game highlighted one fallen superpower who can’t buy it’s way back. Let’s hope there weren’t two on the pitch. The clock is now ticking on an impossible mid-season transfer window. 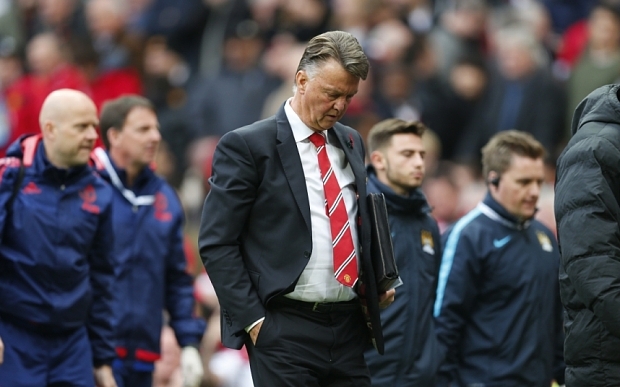 I’ve argued for months that Van Gaal deserves time. I’m sticking with that conviction. It’s not his fault he can’t truly let the players off the leash. He hasn’t got the players. Couple of last thoughts. There’s another blast about Rooney in the United Rant today. Obviously he will never have the burst or be the same player again. He’s had 14 seasons of being kicked. But he’s still scored 5 in 4 games and you would not want that chance on Sunday, in that position, falling to any other player. And finally brilliant stuff from Carrick, Jones and Rojo to go in with the crowd. Just brilliant. Not the greatest of displays agreed. So where do we start? Roy Keane’s attack on Wayne Rooney? Paul Merson’s view that United are a Subbuteo team? The Daily Mail’s Snoozeometer Ratings? The mystery player who says he can be 50% better if only Van Gaal would release him from his shackles? (my bet is it’s DePay). Rene Meulensteen echoing the “free the players” mantra. The Manchester Evening News criticizing the fans? Or Rio Ferdinand talking about the missing “animal” players? Wow. It’s a good job United are second in the league and still have a chance of winning their Champions League qualifying group. Enough already. Can everyone please shut up? Rooney can’t carry the team on his own. The team is set up the way it is because that’s currently the way they can succeed. Anyone remember Boring Arsenal or Don Revie’s first great Leeds team? Or countless Italian, German and yes Spanish teams with a defend first approach? This is my mantra: Players determine tactics. Now I’ll get critical. Meulensteen said earlier this week that Jesse Lingard is Andres Iniesta in waiting. You mean the Lingard that’s missed three sitters in the past two games? If Rooney gets those chances they are buried. If Lingard scores the two last night all the stories of woe would have have been spiked. Instead the headlines would have been about United’s latest youth academy product delivering his full potential or some such other guff and United winning the group with a game to play. The glass is just about half full on Lingard, but he’s nervous and he gives the ball away too many times as well as missing sitters. I’d never start a game without Mata but that’s me. What do I know? There is no God given right that United are going to blow teams away. Over the years too many Tuesday and Wednesday night Champions League and European Cup fixtures prove that. Finally the Guardian projected which team will be top of the league on January 1st 2016. Guess which team it is? Correct their home is Old Trafford. Watching Van Gaal walk slowly down the touchline after the game you got the feeling that here was a man who knew two points had slipped away and can’t wait to get the check book out again. United are solid at the back and in midfield, but as we all know it’s the final third where the magic is missing. Martial is terrific but he needs help. In my opinion Rooney can still contribute, but another forward of proven pace and danger is obviously needed. The clamor to remove Rooney is deafening. After yesterday the Republik of Mancunia let his stats make the point. They weren’t good. His passing was poor, and he had no shots on target. But he is being asked to play a very hard role and he too needs support. Better players are needed. But can you make them available in January? First United have to qualify for the next round of the Champions League. Then the balancing act is if a proven striker is available whose team is out of the Champions league but could contribute to the League and Cup campaigns, do you get that player and another centre half? Or do you try and buy someone who contributes in all competitions? I am very proud of my players because I think we played 90 minutes of a tough game. Both sides played a very tactical game. It was very compact and organised, that is how Manchester City played against us. They adapted the line-up against us. For me the match felt it was played by two teams tired by playing in Europe. United’s squad is thin. I’ve been saying since August Memphis/Depay is a bust and with Shaw out and Lingard still learning, that leaves Darmian, Blind, Young, Valencia and Romero as the frontline squad players. City were without Aguero and Silva, yet apart from Martial Sunday’s game lacked craft and penetration where it mattered. De Gea didn’t have a meaningful save to make, Hart made one rush off his line to deprive Mata and a good save from Smalling at the death. There was almost half a billion pounds in transfer fees on the pitch and both sides were laboured. I’m sure United are working hard in the background to do something in January.